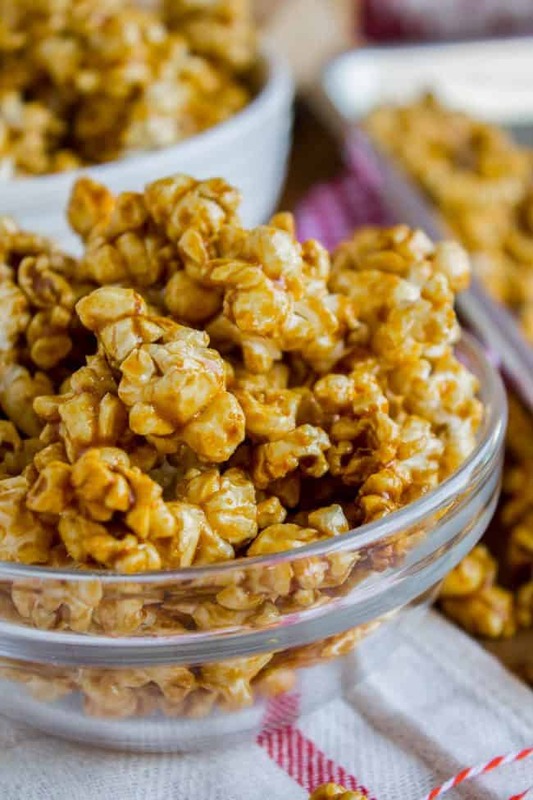 This super easy recipe for Caramel Popcorn takes 10 MINUTES start to finish! You make it in a brown paper bag in the microwave. It is SO crunchy and flavorful! And you don’t have to stir a giant pan in the oven for an hour. WIN. The other day I was on the phone telling my sister Laura just how tacky I am. I bought a new sweater but wasn’t sure if I wanted to keep it, so the tags were still on. I wore it to preschool drop off…and then again to preschool pick up, because by then I had decided to keep the sweater but had still forgotten to take off the tags. That was when Laura told me that she was also wearing a new sweater. With the tags still on…because she was still thinking about whether or not to keep it. Welcome to my family. We’ve got all kinds of class. 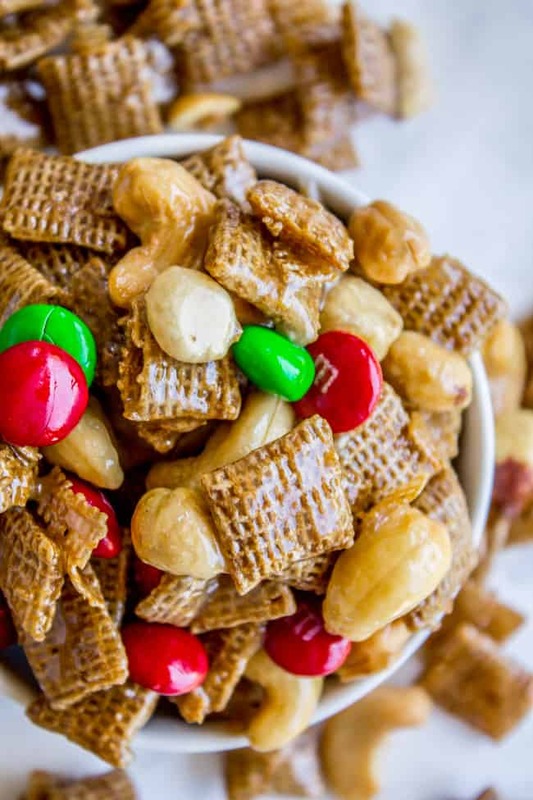 Some things you will love about this recipe: You don’t need a candy thermometer. You don’t need to wait for a special temperature. 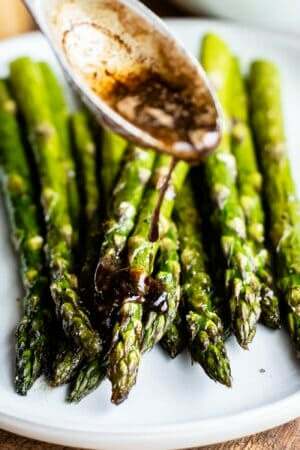 You don’t have to stir forever, on the stove OR in the oven. 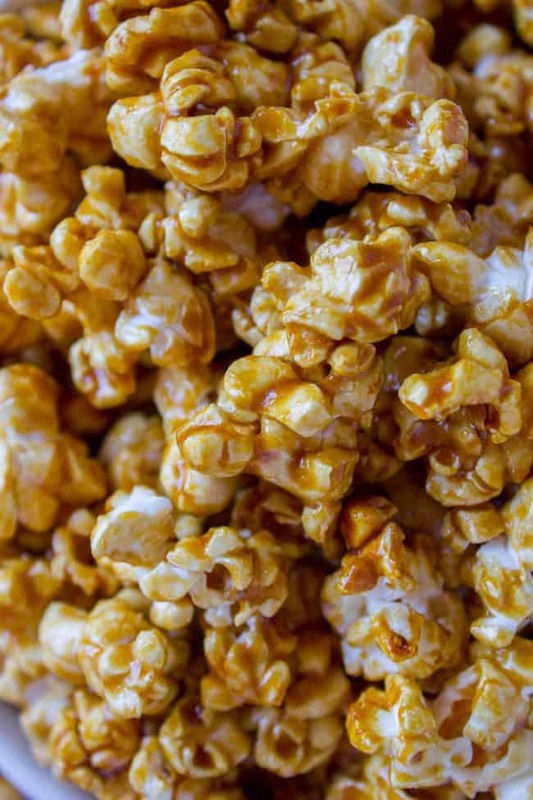 And you can have crunchy, caramel-y popcorn in your mouth in 10 minutes flat. 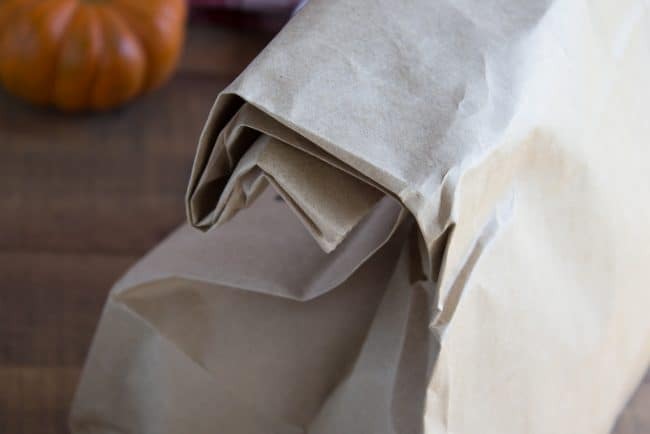 All you need is a clean paper bag from the grocery store (not the lunch sack size–the big guy.) Oh, and a microwave. The microwave is pretty important. It’s what gets you out of using your oven. 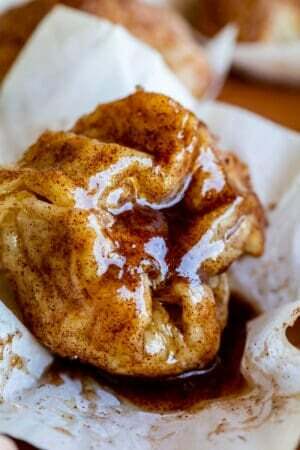 Basically, you add popped popcorn to the bag, boil some sugar on the stove for a couple minutes, then pour it over the caramel and shake, microwave, shake. That’s IT. Here are some packaging ideas. These are mini paper bags, I think I got them at Hobby Lobby. A regular size lunch bag would be cute too, with a ribbon and tag. (Here are some I found that have Christmas designs on them!) 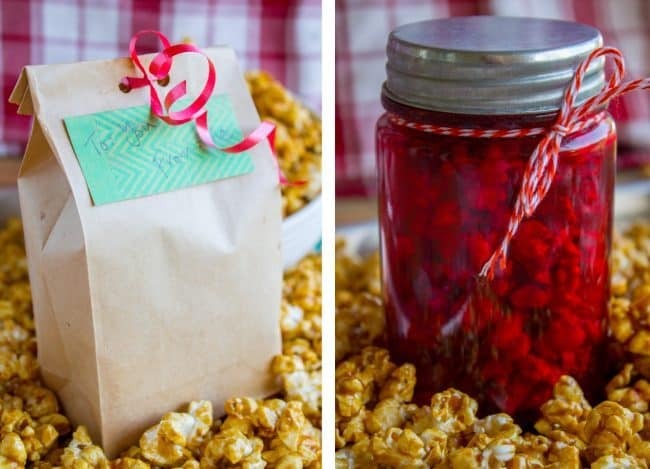 Or you could get these cute red and white popcorn bags. The recipe calls for already popped popcorn. You can either buy a bag at the store to make life easy, or you can pop your own at home. We have had this Orville Redenbacher Presto Pop for about 10 years now. It never fails! It’s so much cheaper than buying bags of microwaveable popcorn. Plus you can add whatever amount of butter and salt you want. It is totally worth the 15 bucks. If you do microwaveable popcorn, buy whatever kind you can find that has the least amount of butter and salt. 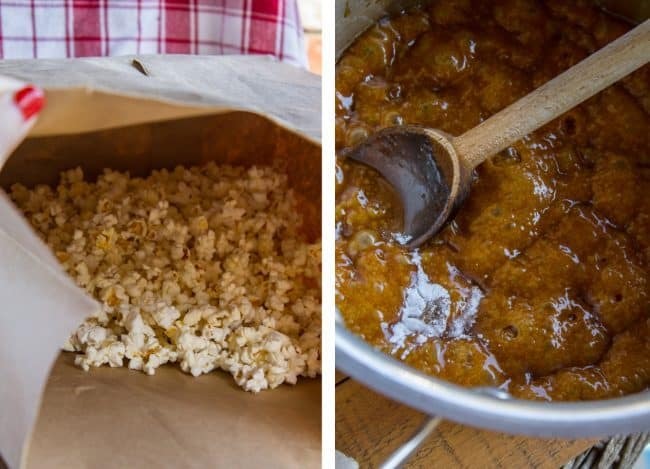 If you use regular movie theater style buttery popcorn, it might be a little overwhelming once you add the caramel. 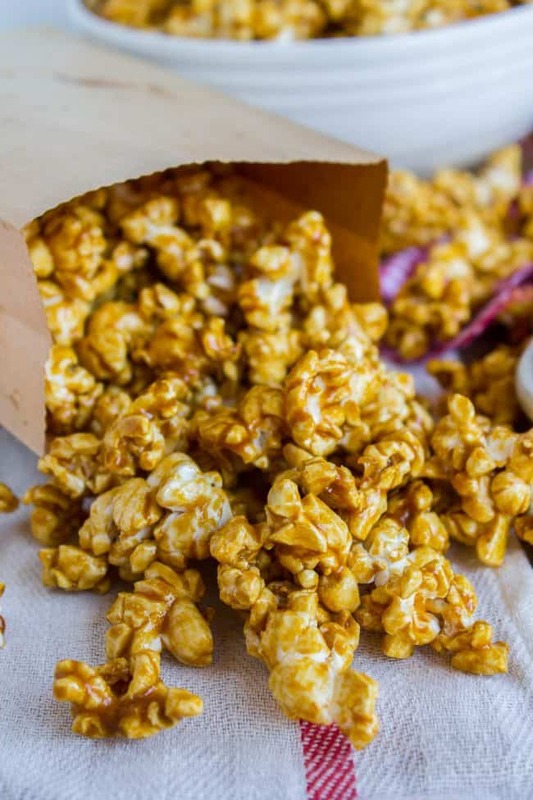 This super easy recipe for Caramel Popcorn takes 10 MINUTES start to finish! You make it in a brown paper bag in the microwave. 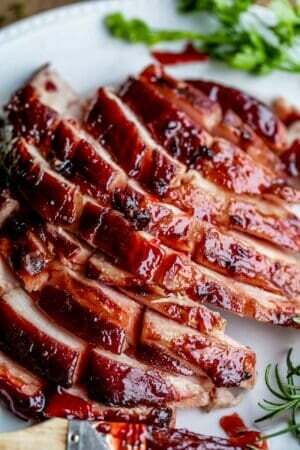 It is SO crunchy and flavorful! And you don't have to stir a giant pan in the oven for an hour. WIN. 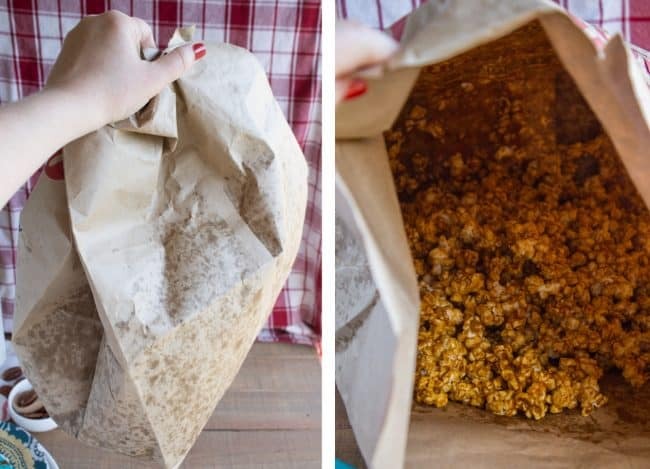 Add the popped popcorn to a large paper grocery sack that hasn't been used (make sure it's clean). Grease a baking sheet with plenty of nonstick spray. In a 3 quart saucepan, combine brown sugar, butter, salt, and corn syrup. Bring to a boil over high heat, stirring frequently. When the mixture is at a rolling boil, set a timer for 1 minute. Remove from heat. Stir in 1/2 teaspoon baking soda. It's going to bubble and foam up, be ready! 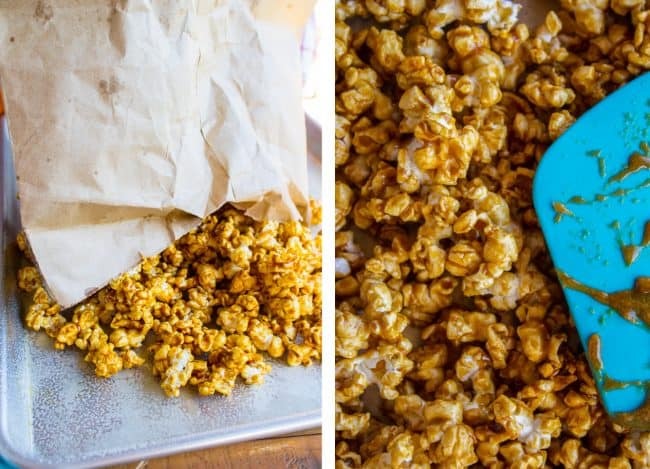 Immediately pour the caramel over the popcorn in the bag. It's nice if you have someone around to help you hold the bag open, but I managed it on my own. Stir the caramel in with the popcorn a little bit. Fold the bag down several times. Place the bag in the microwave and microwave for 1 minute on high heat. Take it out and shake the heck out of it! Keep the top folded obviously. Put it back in (top folded) and microwave for 1 more minute. Shake it like a polaroid. Pour the popcorn out onto the prepared baking sheet, breaking up any chunks. Let cool for a couple minutes, then stuff your face! 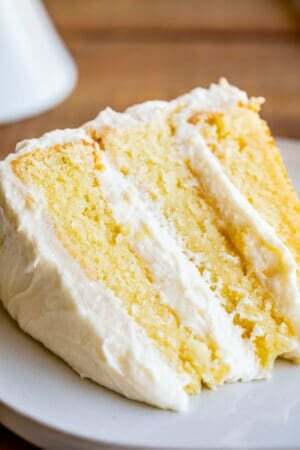 This recipe is from my Aunt Shirley! 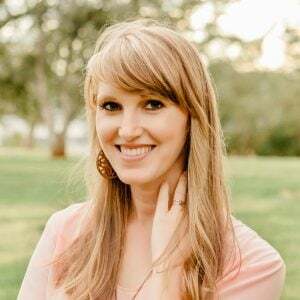 Here are some other ideas for neighbor Christmas gifts this year! 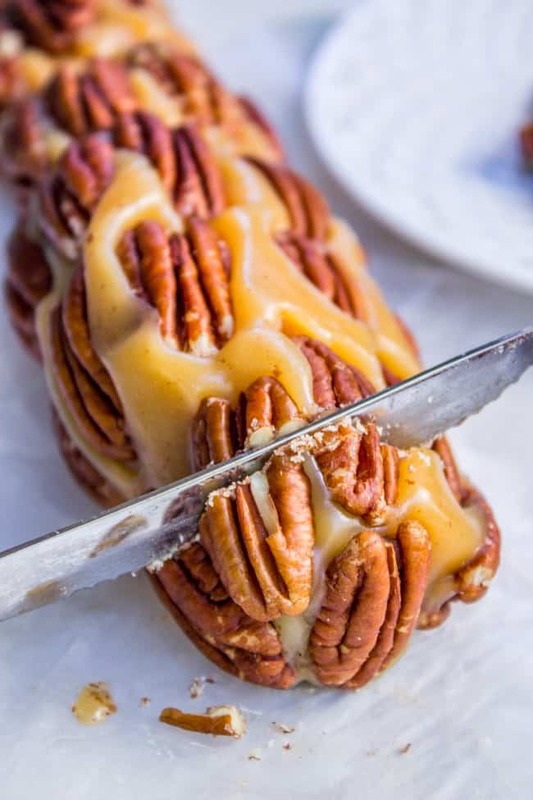 Caramel Nougat Pecan Rolls << I give this to my neighbors every year for Christmas. It’s really something special for the holidays! 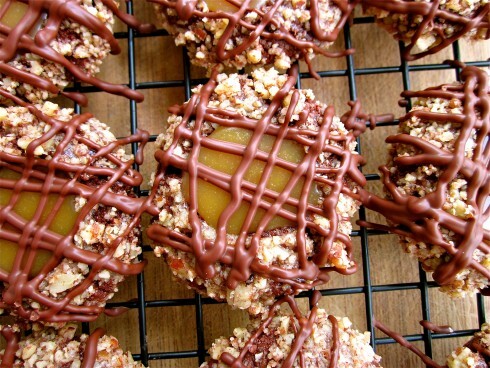 Caramel Pecan Thumbprint Cookies << if you haven’t made these, you haven’t lived! 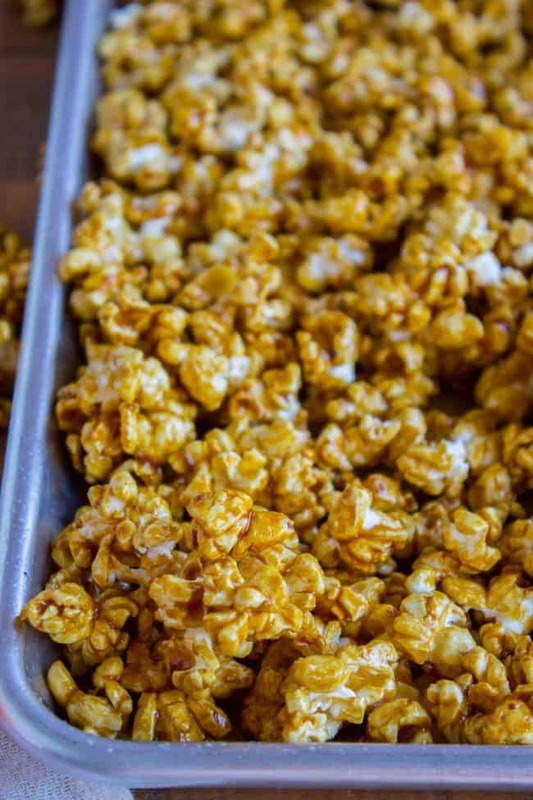 More delicious Caramel Corn recipes from other bloggers! I popped my own corn, added cool melted butter and set aside. I followed the caramel sauce and microwave instructions to the letter. OMG!!! It was, what word is bigger than delicious? I will be smuggling this into the movie theatres every time I go! What word IS bigger than delicious?? I need it, stat! ;) SUCH a good idea smuggling this into the movie theaters! you’re a genius! What kind of popcorn should I use ? Hey Darlene! You can’t either buy popcorn kernels and pop them yourself, or buy already popped popcorn. Hope this helps! Come to California. You won’t be able to find a plastic bag to save your life. And you will have paper sacks coming out your ears, because you STILL forget to grab the reusable bags when you head into the store so you have to buy 10 cent paper ones. (EYE ROLL) Ah well. At least I will always have supplies to make this caramel corn at a moment’s notice!